“We have lost a treasure, and no one can fill his place. All the Nor Hajn mourns his death. 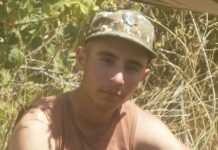 This loss, this pain is something else, you cannot imagine … Tell me how can I survive?” weeps the mother of the deceased soldier Artur Gasparyan, Marine Gasparyan. On the night of May 4, at 01:10 am, the corpse of her son was found at the military base. The 20-year-old soldier was shot dead with two shots in his mouth. From the very beginning, the preliminary investigative body examined the case as inflicting suicide. Investigators have told the mother and sister of the deceased that this does not mean that the suicide version is a confirmed one; rather, it has 50 % of probability. The family categorically rejects the suicide version: “He was not new in the army, was not serving for one or six months, and we cannot say that he did not endure and committed suicide. How could he not endure: his height was two-meters? What hashappened… How could a person talk to his sister at 11 pm about visiting him on Sunday at the military unit? 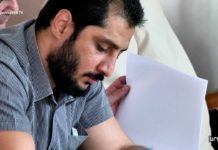 Can a person waiting for his parents to visit him commit suicide?” asks Marine Gasparyan bewilderedly. Arthur has been in service for a year and four months and has long passed the difficult period of adaptation to army life. Artur’s father, Artyom Gasparyan, had specially come from Russia to visit his son. On the morning of the incident, the shift would come down from the positions and on Sunday Artur would meet with his parents. “Two hours before the incident I spoke to him, he was in a better mood than before, as he knew we would go and see him in two days,” says Arthur’s sister. Last time Lilit could not see her brother. Arthur specifically asked her to visit him with his parents; he had missed her. Arthur Gasparyan was drafted to the army on January 23, 2017. Twenty-one days after his death, the Investigative Committee reported that charges have been issued against the senior contracting sergeant of the combat position. “As a result of investigation, there have been revealed incidents of humiliatingly degrading and abusing ordinary Arthur Gasparyan, as well as incidents of violations of combat service or combat duties,” reads the report. The senior of the position is suspected of committing a crime with two episodes: Article 365, Part 1 of the RA Criminal Code – violation of the rules of combat duty– if the offense has caused damages, is punished with imprisonment for a maximum term of 3 years; and Article 360, Part 2 — insulting a subordinate by a headman in connection with the performance of military service duties — the act is punished with maximum 1 year of imprisonment. If the court upholds both accusations, the head will end up with a maximum of four years’ imprisonment. According to Arthur’s family, the five servicemen that were in the positions with Artur remain in service. The suspect is also in freedom. Why did they kill their boy, and who did it? The Gasparyan family applied to the Ministry of Defense with this issue. Without giving any explanation, they sent them to the Prosecutor’s Office. The response to the letter sent to the Prime Minister has not yet been received. The family is dissatisfied with the ongoing investigation. “They do not do anything. When we call, they say that there is no news yet, if any news, we will tell you,” complains Lilit Gasparyan. “Whoever has deprived my son of life, whoever has a slight fault in it, will answer. Maybe I cannot make them to answer, but God can do it,” Marine is convinced. Five servicemen who were at the position said that they were in a different location, Arthur was in a trench. The family was told that no fingerprints were found on the weapon, which is strange, unbelievable. Artur has never complained about the service. The mother is convinced that if her son had been offended, he would share with her, she would realize it. Mrs. Marine is left to be comforted only by recalling her son’s loving words. “Every time he called, did not say ‘mommy’, but ‘my sanctity’. He said, ‘Daddy is my friend and my brother, but you are my only one, you are my sanctity’ … “.